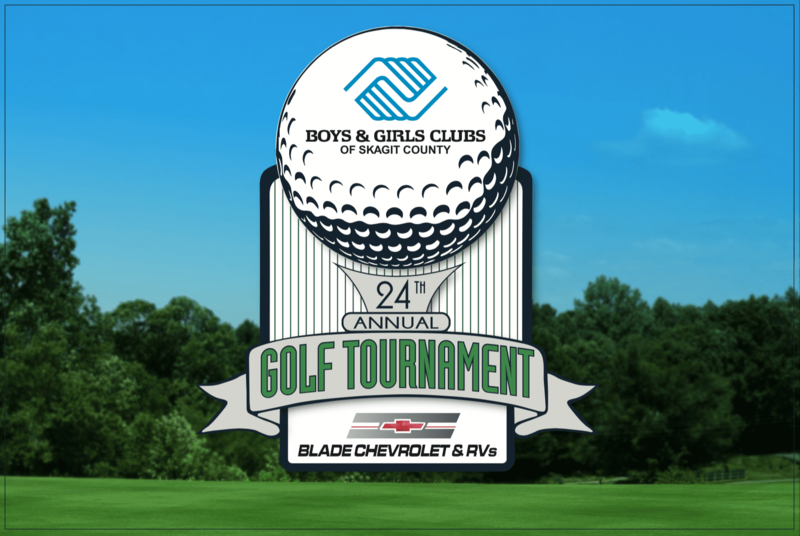 Our Annual Golf Tournament, sponsored by Blade Chevrolet, is one of the premier golf outings in the Northwest. Known for the food and beverages we provide to the players, as well as the service, fun and prizes, our goal is to provide you an entertaining way to support our local Clubs. By participating in this event, you are making a difference in the lives of local children. To register, use our online form or visit our Admin Office for registration forms at 1605 William Way, STE B, Mount Vernon, WA 98273. Golf registration includes lunch, green fees, cart, dinner & prizes! This gets you into all the games throughout the Tournament, all the raffles, provides you with two mulligans, and is your declaration that you may love golf, but you’re here to support great futures for our kids! Bypass all the lines by pre-purchasing your package early! Registrations received before July 31st will be entered in a drawing for four rounds of golf. Dress Code: Shirt with collar, no cutoffs or short shorts. Handicap: This is a handicapped scored tournament. If you would like your handicap to be calculated into your play, please provide this information for each golfer. Prizes will be awarded for low gross and low net. Sponsorship levels include additional recognition. To learn more, visit our Event Sponsorship Page. This gets you into all the games throughout the Tournament, all the raffles, provides you with two mulligans, and is your declaration that you may love golf, but you're here to support great futures for our kids! Bypass all the lines by pre-purchasing your package early! Choose your option below to purchase individually or for your team. I am unable to attend the Golf Tournament but would like to make a donation. Please pick one of the amounts above, or enter your amount in the next field.